The Watershed Health Assessment Framework (WHAF) provides an organized approach for exploring the complexity of natural and human communities as they continuously exchange material, energy, organisms and information. The WHAF can reveal patterns of ecological health from multiple viewpoints, and encourage information sharing and collaboration; fostering innovative ideas that help the health and resilience of our natural and human communities. The WHAF is an approach that uses a 5-component framework to consistently evaluate watersheds from different perspectives. Explore, interact and learn about Minnesota's watersheds and their health. Use the Map to view health scores, find data and share observations. 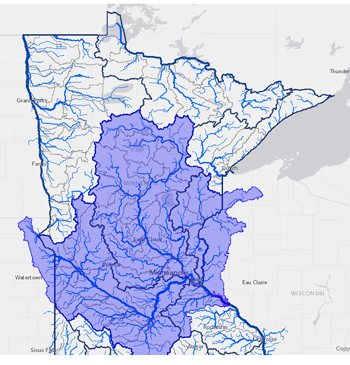 Find quick access to reports for Minnesota's watersheds, cited literature and recommended readings about system science. Subscribe to the WHAF newsletter for updates. This program is made possible by funds from the Clean Water, Land and Legacy Amendment.